This beautiful antiqued metal table top display easel holds all frames sold on Lisas Elegant Things and "I Do" Engravables. Displaying your Signature Mat on this easel is sure to "wow" any house guest! 36" tall. Support arms are adjustable for height. 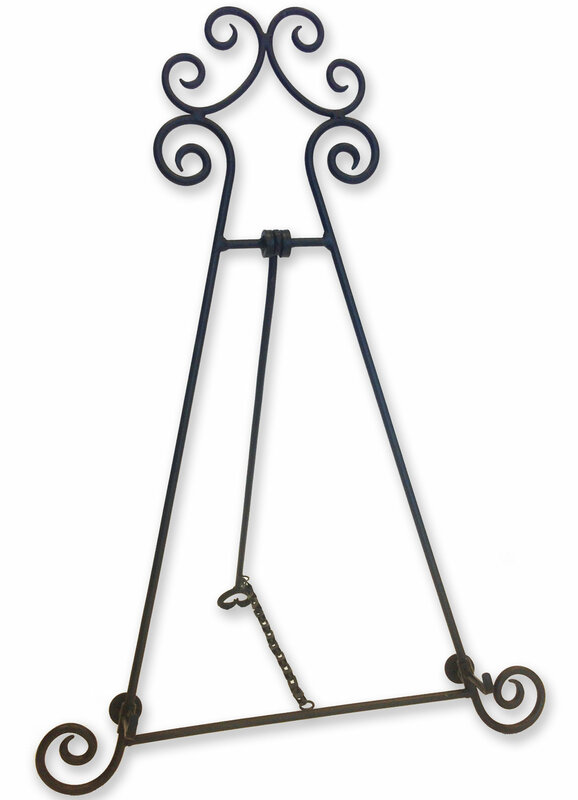 High quality wrought iron design. Fits the small, medium, and large signature frames. Wish I could actually rate the product but it was never received. Difficulty with shipping and now I am left without the product which was fully paid for. Great quality, they had shipped the wrong size mat and immediately mailed the correct size. Great response time. What is the "personalization area background color?" How does this signature frame thing work? Do I send you my photo? There is no need to send your photo. You frame will come with bendable tabs on at the back that allows the backing to be removed easily. All you need to do is tape (masking tape is best) your photo to the mat so that it is centered in the picture opening and then replace the backing. You can even change the photo again at any point after the wedding with ease! We recommend you use an archival gel pen. Ball point pens require the writer to press harder thereby denting the mat. Markers will run if they come in contact with any moisture. We recommend archival gel pens only for signature frames which do not fade over time. Just a side note, you should NEVER hang your frame in direct sunlight. Any ink will fade over time if exposed to direct sunlight.